Some additional lanyards found recently at an insignia show here in the U.S. Have not checked Tim's album yet to find matches for Id. The bottom lanyard in the second pic is actually Brown and Yellow. Thanks again to everyone for their input. I need to go through my lanyards and tag them with Id's and possible Id's. I am always a bit surprised at the items that have made it over the pond. Who was collecting these here in the U.S. and or how did they get here? I know of no one in the recent past or current that had an interest or was aware of lanyards let alone how to Id them. Good news is there is no competition anyway. I now see the brown and yellow but cannot identify. Lanyard identification and usage can be tricky, not helped by a lack of published material. Even MOD official documentation is often vague with colours described as 'Blue No 3'. Also manufacturers variations and colour fading. 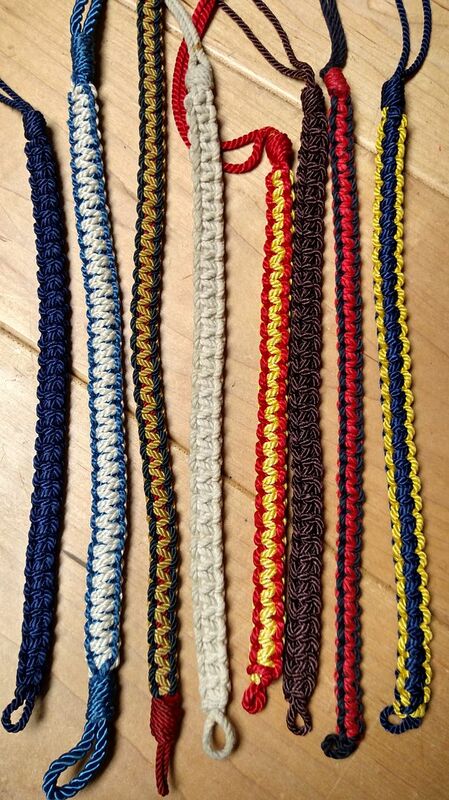 British Army style lanyards were/are also worn by the armies of other countries and by non-military organisations. Black and white WW2 photographs do not usually help and often the lanyards were only worn in 'best' Battle Dress. Probably not surprising that there seem to be few collectors around! "Manui dat cognitio vires - Knowledge gives strength to the arm"
"Better to know it but not need it than to need it and not know it!" The first photo in post no.16 - the red with black trim worn in 1980 by "B" Class Drill Leader at Eynsham Police Training Centre, a Class Leader wore red with white trim. The blue one is / was worn by Royal Corps of Signals, I have one of that design obtained from a R Sigs man in 1979.